I was never a fan of reality shows. Although I watch some, to pass my time. Not my fault, every single channel is filled with them anyway. Mtv though has totally gone to the dogs. Gone are those days when only music played 24x7 on Mtv. Sigh! 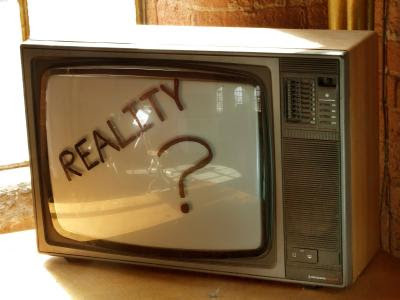 I'm pretty sure that there is not a single channel without a reality show. Why don't they come up with a single channel and air all the reality shows on it instead? Some of these shows are ridiculous. You cant believe such things actually happen in real life. 'Raaz Pichle Janam Ka', is the most horrendous show I have ever seen all my life. On the show, people lie down on a rather uncomfortable looking couch and are brainwashed by a psychic and they can magically view their past. The re-construction of the past is unbearable. I don't know what the purpose of the show is. Do they make money, do they stay in the past, I have no idea. I sat through it for 10 minutes and my sister promised to disown me if I dint change the channel :P .
'Is Jungle se Mujhe Bachao', the desi rip of the 'I'm a Celebrity, get me out of here' initially started out interesting. I was actually glued on to it for 2 episodes, until Kasmera Shah decided to take a shower on National Television. That too under a waterfall. That was all I could take. Heights of getting audiences to view their shows. And people actually participate in them? Only small town celebrities (read Swetha Tiwari, desperately trying to come out of her 'Prerna' avatar by slipping into minis and bikini tops. Chetan Hansraj the dashing dude, honestly I find him really good looking. One of the primary reasons why I survived 2 episodes. His 4 year long serials came to an end (finally!) and then mister decided to appear on this show to make his presence felt. He was the runner up of the show I guess. Anaida desperately trying to regain lost popularity after her singing career sank without a trace. Palak, the ex-roadie. Like she dint show her dramatic skills enough on one reality show, that they got her into another.) Phew, producers do have some sense of imagination. 'Splitsvilla 3' on my beloved Mtv is more *beep* than talk. If you want your child to grow up soon, make him/her sit through one episode of this show. Although I strictly advice not too. 'Roadies 7', is no fun without the evil twins. So I have never seen a complete episode of it and hence wont comment on it. Heard they have Irrfan Khan on it as some sin guru or something like that. Poor guy, I can imagine the money they paid him to appear on such a show. Especially after movies like 'Metro' and 'Maqbool'. The 'Stunt Mania' show was pretty good. It was really good to see young woman bikers on it. That show was different and was worth a watch. Then came the matchmaking shows. 'Perfect Bride' where a mother finds a perfect bride (if something like that exists that is) for her son. And till today I have not figured out why would anyone want to marry Rakhi Sawant or Rahul Mahajan and get pitied on National TV. I recently came across one show where children are fighting each other to win the prize which is to take their parents on some religious 'Mahayatra'. Sigh! Just when I thought I had seen it all, my best friend decides to tell me about this show called 'Emotional Athyachaar' on Bindaas. She literally tortured me into watching it. One thing I'll never forgive her for :P. Just the thought of the show gives me creeps. No its not a show where you're surrounded by creepy looking things, or the one where you are strapped to a lie detector and have weird questions thrown at you. This one is worse. Its a show where a guy/girl comes to the channel if they think that their partner/spouse is cheating on them. The channel then promptly send in a tempter or a temptress to seduce the person under question. The show even records the intimate moments between the two. You think that's worse? Wait. The person who came seeking help then has to sit and watch the recorded footage, with a rather cold looking host(read Angad Bedi, his cricket or modelling career dint soar high. So he too fell for the reality brigade). Then they confront the cheater and then there is a horrible break up on National television. I need to meet the creative head of this show. I have a number of serious problems with this show which is a miserable rip of 'Cheaters'. One, sending a tempter or a temptress to seduce the victim is horrible. More often than not, normal people fall for it. If some hot girl is throwing herself at a guy, then I don't blame the guy for thinking he has a chance. Two, letting a person watch videos of his/her partner making out with someone in an enclosed room is torturing. That too on National TV. Just think of the embarrassment the person will go through when public spots them. I shudder to even think of it. One thing I have to hand it out to the show. The name is apt. Its Emotional Athyachaar indeed. Three, okay lets forget the fact that the videos are shown to the partners. After that cant they just end the show. Leave it to the couple to deal it out. But no, how else will the TRP's raise. The confrontation, the break up, the accusations, the howling, screaming and the tears is all out there for audiences to see. This is what is exactly called as making money out of peoples' misery. Torture indeed. Such shows put ideas into people's head. One episode, and I was done with athyachaar for a life time. But I do know a lot of people who watch it regularly. Either they have a heart of stone or are people devoid of feelings. Or maybe something is wrong with me. My friends always tease me by saying that God forgot to give me brains and tried to compensate by giving me two portions of the heart instead. I don't know to be happy or sad on this one. Some tolerable shows are Yash Raj's 'Lift Kara de', where the biggest fan of a celebrity is picked through some contest and then the fan along with the star 'lift' some person's life who are usually disabled or under provisioned. 'Sach ka Saamna' was thought provoking, but it had to leave after having its own share of controversies. 'Bingo' with Abhishek Bachchan as the host is fun to watch even thought the game is super silly. Maybe, it has to do with the celebs who appear as contestants. One show I miss is 'Oye its Friday' with Farhan Akthar. He's the ultimate host. That was a thorough entertainment talk show, if not a reality show. Channels need to come up with more of such shows. The reality shows on Discovery Travel and living and a few in AXN are top class. Shows like 'Top Design', 'Sheer Genius', 'Top Chef', 'Project Runway', 'Hell's Kitchen' etc set up a mark. I guess that's the difference between India and the west :-(. Nowadays I get freaked out to put on the TV. Honestly, the saas bahu crap doesn't seem all that bad now. I pity Indian Television programming,and for once,happy that it has no place to enter my home. First time ever, I envy you.. you dont have to see such things.. do try to youtube a few of the episodes and you'l know where my sanity goes..